The X Files actually don't speak about monsters but about men, what can men become because men can do more horrible things than what we see on The X Files. 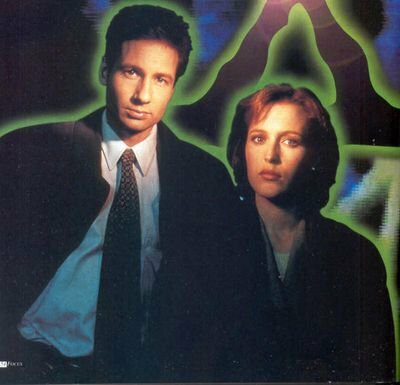 It reflects our fears (the fears we can feel in our society) but also our dreams : we all want to believe that there is something other than this life, we all would like to stay young forever and we always will, that's why X Files is up to date and will always be. 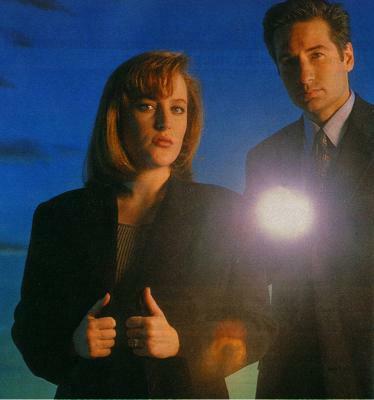 X Files is created by Chris Carter. It's a really good series because I think it's the first series where a man and a woman are considered as equals. I know that Fox Mulder is almost always right but Dana Scully is really intelligent too and Mulder needs her help to resolve the different cases. Scully is a good example for every girl and woman : she's independant, intelligent. She does a good job. Many girls want to look like her in the real life and I'm pleased for that. Geeeeeeez comment que j'aimerais en avoir un aussi !!!! Et vous, ça vous dirait d'être un agent ??? AloOoOors, qui me suit ??? Pourquoi ai - je appelé mon blog queequeg0925 ??? ( Ben oui, je sais, c'est super ridicule mais que voulez vous, je suis une BIIIIIIIIIIIIIIG fan. ( Je pourrais même continuer avec les iiiiiii mais je vais arrêter heiiiiin, vaut mieux ^-^).